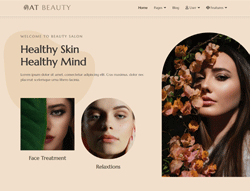 AT Beauty is a Premium Joomla template that targets for Spa or Beauty websites. This is attractive template used for beauty and relaxation websites to showcase and promote your beauty salon. Besides, it provides detailed information about its beauty services such as make up, nail art, hair styling, skin care or pricing tables. AT Beauty builds on powerful framework with 100% responsive layout (supports mobile / tablet version) based on latest Bootstrap CSS Framework, Support Font Awesome and K2 extended style. Moreover, it comes with 4 color styles and boxed layout helping to create wonderful websites with various layouts.